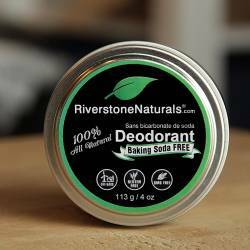 One of our most popular deodorants made with 100% natural ingredients. "PURPLE" has a gentle, citrusy, floral scent with a soothing and calming blend of pure essential oils. 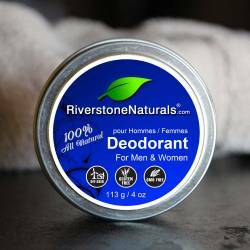 Riverstone Naturals Purple Deodorant is strong enough for both men and women to keep you dry but also safe for expecting and nursing mothers. 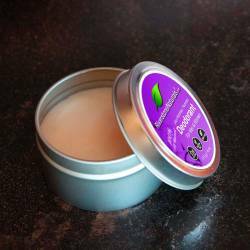 * "Purple" is our #1 selling natural deodorant - it actually works! Money Back Guarantee! * Favorite among expecting and nursing mothers. * Naturally effective against bacteria, yeast, and fungi. * Antibacterial essential oil blend reduces bacteria and odor. 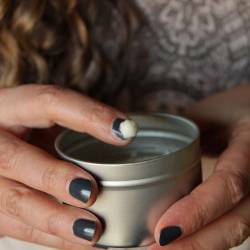 * Say "Goodbye" to aluminum-based deodorants forever! Use with care in sun: Contains citrus (Lemon & Bergamot). Avoid applying to skin that will be intentionally exposed to sunlight or UV light such as suntan beds or intentional suntanning. Typically not a concern for most people. The information on this page has not been evaluated by the Food and Drug Administration. This information is not intended to diagnose, treat, cure or prevent disease. Any and all claims of healing properties are based on widely accepted scientific research done on the properties of the individual ingredients. Neither Health Canada nor Riverstone Studios / Riverstone Naturals endorse the practice of ingesting essential oils. Always consult a physician regarding health conditions.